Recently announced Medicare Advantage policy changes could open up new opportunities for senior living providers, further accelerating the transformation of the industry’s dominant private-pay revenue model. “Senior living providers are crazy if they don’t start thinking about housing/health care integrated products,” Anne Tumlinson, founder and CEO of Anne Tumlinson Innovations, told Senior Housing News, in light of the newly announced changes. Tumlinson is a noted expert on senior living and care, and has been working with the National Investment Center for Seniors Housing & Care (NIC), among other organizations, to educate the industry on the topic of Medicare Advantage. Last Friday, the Centers for Medicare & Medicaid Services (CMS) announced that it would allow Medicare Advantage insurers to test a variety of innovations within the value-based insurance design (VBID) model, starting in 2020. That is, VBID plans have been designed to maximize access to services that could help older adults, particularly those with some chronic conditions — including dementia — maintain their health and wellbeing. The idea is that this will not only result in better health outcomes but drive down costs within the U.S. health care system overall. Initially, CMS rolled out VBID in sevens states in 2017. However, under the Bipartisan Budget Act of 2018, eligible Medicare Advantage health plans in all 50 states will be able to apply to participate in VBID beginning with calendar year 2020. Per the changes announced Friday, senior living companies that double as Medicare Advantage insurers also have a new opportunity to participate in VBID. All special needs plans (SNPs) — including chronic condition SNPs (C-SNPs) and institutional SNPs (I-SNPs) — will be eligible to participate in VBID for 2020. Special needs plans were first introduced through legislation in 2003, to enable Medicare Advantage coverage for particular high-need patient populations, including some residents of senior living communities. McLean, Virginia-based Sunrise Senior Living and Catonsville, Maryland-based Erickson Living are two companies that offer special needs plans to their residents. However, it remains to be confirmed whether I-SNPs in VBID will function under all the same general rules that I-SNPs operate under today, Tumlinson noted. In addition, starting in 2021, a Medicare Advantage hospice benefit will start to be offered through VBID. This is a landmark step that some observers have long anticipated; currently, hospice in not an allowable benefit in MA, which has created care fragmentation and drawn criticism from groups such as the Medicare Payment Advisory Commission (MedPAC). Though their businesses have historically been driven by private-pay revenue, senior living providers have been eyeing Medicare Advantage as a possible payment source. Last April, CMS announced that MA plans would be allowed to offer supplemental benefits that cover some non-medical, personal care services in people’s homes starting this year. That created the possibility that MA could begin reimbursing for some of the services often provided in settings such as assisted living. This potential opportunity has spurred interest and activity among senior living providers. For example, Bloomfield, New Jersey-based Juniper Communities has been leading an effort to create a consortium of providers to launch a Medicare Advantage offering of their own, tailored to senior living. Juniper CEO Lynne Katzmann was encouraged by CMS’ latest announcement, as an indication that plans might have even more latitude to cover senior living-related services. Tumlinson agreed, and believes that these VBID changes could have an even more profound effect than the supplemental benefits changes announced last April. Her reasoning is that MA plans offer supplemental benefits only out of a “small, marginal amount” of dollars left after a traditional benefits package is created. In other words, MA insurers — which run the gamut from behemoths like Humana (NYSE: HUM) to more boutique or regional insurers — receive dollars from the federal government to administer the Medicare benefit. Usually they are required to offer all the same benefits as traditional Medicare and then have flexibilities to tailor plans. Under VBID, they have much greater flexibility “within the full premium dollar,” Tumlinson said. So, VBID plans — not traditional plans offering supplemental benefits — might ultimately make the greatest inroads in covering residents of senior living communities. 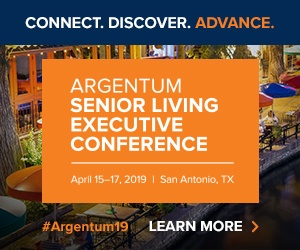 At this point, there is more speculation than certainty when it comes to the senior living opportunity in Medicare Advantage, but providers can be certain that MA will never cover room and board costs, Tumlinson said. Still, the newest Medicare Advantage changes showcase that the federal government views MA as a testing ground for innovation in benefit design. “[These changes] point to growing opportunity and flexibility in the MA program that perhaps a particularly innovative senior living provider could harness to create something really different in terms of a combo health plan/senior living product – where the savings in health care spend could be flexibly deployed to non-medical benefits,” she said. Even if a provider does not want to start its own insurance plan or be on the leading edge of innovation, forging closer ties with existing MA payers is becoming a strategic imperative. To forge these closer ties, providers will almost certainly have to demonstrate — through data — their ability to provide superior care for a pool of MA beneficiaries. Having significant scale and offering a range of care types might also be helpful, as large plans in particular want to be selective, partnering with a few sizable providers rather than multiple smaller ones. Irvine, California-based Silverado is one example of a provider trying to pivot toward this future. The company is known primarily for memory care, with about 40 properties across eight states. However, it is also expanding its hospice business and it is collaborating with Medicare Advantage insurers such as CareMore in some markets.